London: Victor Gollancz LTD, 1983. This is the first United Kingdom edition of People of Darkness. This edition was published in 1982 by Victor Gollancz in London, England. This is the fourth book in Hillerman's Navajo Mystery Series. 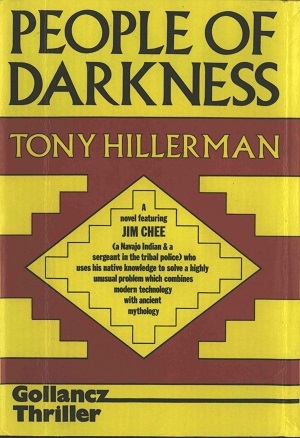 People of Darkness is the first novel featuring the protagonist Sergeant Jim Chee of the Navajo Tribal Police. The cover is not credited but has a red and yellow geometric pattern around the book title. The edition is hardback with a full dust cover, and the back dust cover has a list of Gollancz recent thrillers. Format: Hardback, 20.3 x 13.2 cm. Binding: Red boards and spine with the title, author, and publisher printed horizontally in gold on the spine.